ICPCN aims to provide a global voice for children’s hospice and palliative care and to advocate for the rights of children to receive the palliative care they require. 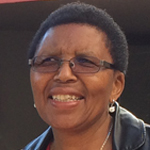 Busi is a professional nurse and midwife and spent 13 years working as a Primary Health Care Nurse Clinician in the South African public health care service. She joined the field of children’s palliative care in 2000 and worked with children with HIV & AIDS and their families. She has qualifications in Nursing Education, Nursing Management and Community Nursing Science. Busi has been with ICPCN since the beginning of 2012 and has made great strides in this short time towards achieving our strategic advocacy objectives. To ensure that advocacy activities are rooted in a strong evidence base. Develop necessary and review existing position/discussion papers on specific issues based on scientific evidence. These will be sent to target agencies e.g. UN CRC, WHO, donors, etc. Liaise with research and scientific sub-committees. To engage with influential global, regional and national bodies as an essential component of the advocacy strategy. Target key international awareness raising opportunities. Identify international and national awareness raising days, plan and implement activities to promote Children’s Palliative Care. The ICPCN team has supported the Kenyan Hospice and Palliative Care Association (KEHPCA) in providing further CPC training in that country and the visit of Dr Patrick Mburugu for an internship in South Africa. ICPCN has participated in the training of health care professionals in Zambia, Kenya, Sudan and Swaziland and the training of post graduate nurses in South Africa. We continue to recruit champions and ambassadors worldwide.